Several playgrounds between 3rd and 4th Avenues get a lot less traffic than their 5th, 6th, and 7th Avenued counterparts for one, long, obvious, loud and smelly reason: The Gowanus/BQE factor. Sure, strip clubs aren't supposed to be too close to playgrounds and schools (except in Sunset Park, apparently), but we can pump exhaust fumes into the lungs of playing children all we want. 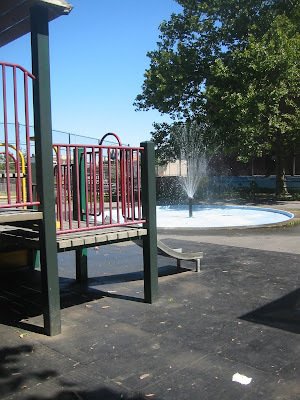 Despite this, I ventured over to the 41st Street Playground that is just behind Charles O. Dewey on 4th Avenue to check out the mini-sprinkler and climbing options. Since it was 9:30 on a Saturday morning, the traffic was barely noticeable on the Expressway, and the playground was deserted. This playground gets locked up at night, and the gates are pretty high. It was a little trashy, but the garbage was tame - no beer/rum bottles, no condoms, and no poop. There was a dead pigeon in the fenced off grass to the side of the sprinkler, but that was it. The sprinkler is a mini-version of the big one in Sunset Park. The kids weren't particularly interested in running through it, just around it. Some older boys found it very easy to fill plastic bags to make the slides slickery, but thankfully they stuck to just one of the slides and performed their hijinks away from the smaller players. All in all, it made for a very pleasant morning. The jungle gyms were shaded, and they are set up to allow toddlers to run around them instead of just back and forth. There are also some mini-benches/counters under the platforms which allow for pretend play or a rest. There are four toddler swings that also had shade. (I never knew why parents were so obsessed with shade until I had kids.) "Big kid" swings are not present here. This playground is in the middle of the block, and the other parents I met there were friendly and actively watching the small children. A bonus is that the playground is adjacent to the ball field where the little league-esque baseball practice and games happen. I'm sure it will be fun to watch as a break from the playground. The 50's and upper 40's also have playgrounds - including one directly across from Lutheran Medical Center - closer to the Expressway. If you're looking for smaller crowds or a new playground scene, give them a chance. 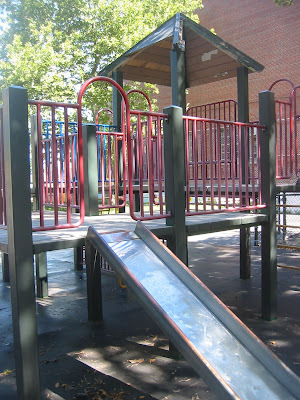 We use this playground a bit because it is closer to our place (and downhill from Sunset Park). It is usually cleaner than the Sunset Park playground. One parent warned me that their child got some kind of rash from the grassy area near the sprinkler. During the school year, there are a lot of middle schoolers that hang out there after school, but I found them to be usually very respectful of my toddler.